During our quick trip to Ohio for Christmas, The Husband and I got a chance to see The Hobbit. Being big LOTR geeks, we were ecstatic that we could view it sans kids. Of course, the movie was breathtaking and full of adventure, and I couldn’t help but think of all the cool lessons we were learning throughout the film. Spoiler Alert: these may or may not tell parts of the film. These also may or may not be real life lessons. How’s that for ambiguous?! I sort of knew this from the previous LOTR movies, but in The Hobbit, our suspicions are solidified. A quick trip to Rivendell tells us how “into green living and eating” they are, and why is seems like they never age. Lettuce is their friend. The only non-hippie part about their commune? All of the crossbows and swords used on a regular basis. And the mind-reading. That’s not hippie-chic, it’s just creepy. In the movie, we get to see a younger (ha! ) Gandalf and also a younger and less Satanic Sauroman. They both seem as if they are just starting a great journey, bound to do something to make a difference or embark or a great adventure. We all know where they end up in the end, but it’s a great reminder to us that we all start out with bright eyes and a wide heart, even when you know how to conjure up just about anything. Like most of us, Bilbo gets stuck in a rut and is too stubborn to see it as such. With the arrival of a 13 strangers to his doorstep, who refuse to leave, he has no choice but to loosen the hell up. 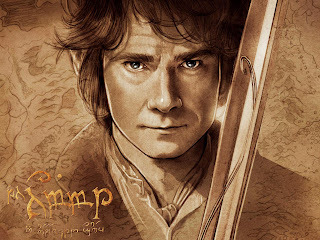 While it still takes him some time to see the value in the adventure presented to him, he eventually understands that he needs to get lost, leave The Shire behind for a while, and see what will present itself during his time away. Getting lost is the best way to find yourself. They just are. They also tend to save people’s(or Hobbits, wizards and Dwarves) lives when you least expect it. No wonder humans get tattoos of them all the time. It’s the small things, everyday deeds that keep the darkness at bay. The gray wizard is oh so right. We must keep on, strive for good and provide small acts of kindness all day, everyday. The light of many can easily defeat the darkness of one.